Our Private Off-Road Club (WildTracks4x4) used to rent Satellite phones from other companies and we thought that the level of poor service and lack of professionalism was the industry standard for Satellite phone rentals in South Africa. Then we came across Ashbury SatCom, and was that a wonderful blessing in disguise. Their ONLINE solution is quick and easy. The service and advice that we received from Charles, excellent and from the start we realized this is how service should be. We have moved on and made Ashbury SatCom our permanent travel partner by buying one of their Inmarsat phones and recharging the airtime via their website. Thanks Team Ashbury, keep up the excellent Service and advise! All you need when you're 'out there'! Following a hunting accident when we were well ‘out of range’ we decided that too often there had been ‘close shaves’ in which a sat phone would have been essential to recovering the situation at hand – so we started looking around and found that Ashbury Satcom offered not only great products at decent prices (internet makes it easy to compare!) but they also provide great advise in helping us choose the right solution for us. We went for the iSatPhone 2 and it arrived swiftly at my door within 2 days of purchase. It’s early days for us but I’m really happy with what it offers and how it performs on a few test calls. I’ve used a variety of other sat phones in the bush over the years and this certainly seems to do all that’s one needs and as good as others I’ve tried. I especially like the ‘holster’ it comes with as it offers great protection without being bulky and is easy to clip on to your belt or pack or just through in your ‘day pack’. I’ve been using my iSat Phone backed by Ashbury Sat Com for a few years now. Initially it was as an emergency tool as I do solo motorcycle overlanding, so it is my ONLY lifeline in the event of breakdown or medical emergency – my life insurance and piece of mind. More recently I started single vehicle overlanding in my Jeep, with my wife and young kids. My primary role is to ensure the safety of my passengers. Without my iSat Phone and Ashbury backup I would never undertake such an adventure – for me, I feel that traveling without this crucial piece of equipment would be both irresponsible and foolish. On our last journey this past month we traveled through Moremi Game Reserve in Botswana. 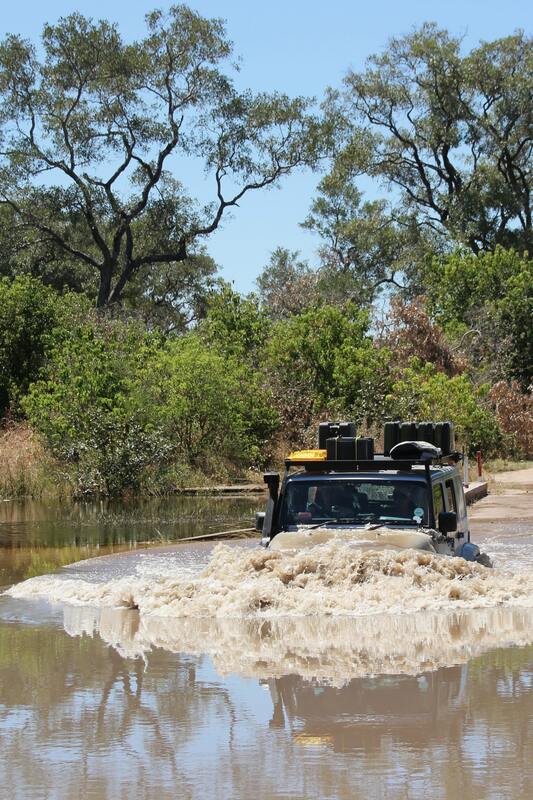 The record high rainfall in March meant some seriously muddy tracks and navigating deep water crossings (water over the engine hood, see pic) in order to reach camp sites and viewing points. This would not have been an option without the backup which my iSat Phone provides. I discovered something else about this phone on this trip. Whilst driving through Moremi, with my iSat Phone placed on the dashboard against the windscreen with the antennae pointing upwards, I remained connected to the satellites 90% of the time, ensuring that my daughter (she could not make the trip due to university exams) could call me in an event of her encountering an emergency. I now never leave on any long trip without this phone, whether in the bush, or on tarmac. It is my lifeline and backup where all else could fail. Way more insurance than I had ever bargained on! My experience with Ashbury has been very good. The phone was delivered promptly and as promised. When I had some additional questions Keith was very quick to respond with advice and additional information. Recently used this product on a 3week trip to Mabuasehube ,Botswana .The phone performed exceptionally well , we were always able to pick up a clear signal and the simplicity of operation suited our needs.Great phone and will use again on our next trip. Brilliant phone obtained with brilliant service!! Not knowing anything about Satelite phones I contacted Ashbury SatCom to find out more. What would be the best phone for my purpose. During the phone call, i changed my mind several times on what phone would be the best phone for me. With patience from Charles Barber listening to every nagging question I had, I finally decided on the Inmarsat iSatPhone 2. I immediately placed my order and had the phone delivered at my house in no time. Thank you so much for the excellent advice and undeniably the best service I have ever had from an online shop. My number was activated within 15 minutes after receiving the phone and was I surprised with the clarity of the handset. I made a few calls, sent some messages to my wife just to test and the call quality is just as good as my Note 5. I have since tried the phone at several locations and never had I been dissapointed. I will soon be testing it from the cockpit of my plane – even though that was not the advice… but I have to see for myself. Oh … and the bluetooth functionality is great…. Thanks Charles. Perfect, lightweight and almost immediate signal reception. Can not wait to test the product in the rural areas of our bordering countries. Battery life exceptional and the fee web text service a big plus point. Comes with great accessories in the box – carry holster, 12 v charger, 220v charger, laptop/computer cable, earphones etc. Having bought the Inmarsat iSatPhone 2 a year ago from Ashbury SatCom and having used it on numerous bush trips through South Africa, Botswana, Namibia, Zimbabwe and Zambia, I must say that the experience has been excellent. The phone registers on the network very quickly, and we even managed to get it locked-on from a slow moving car when holding the phone out the window. Voice quality is excellent irrespective of whether the call is local or half-way around the world. Battery life is good to excellent. The dust caps over connection ports have proven to be invaluable in the dusty outback. My only gripe with the phone is the archaic text input method, which is reminiscent of the cell phones of the 1990’s. These guys are a great company to deal with – always happy to advise and service levels are excellent. Great phone and great guys to do business with! Always available and great deals. I bought a Satphone 2 last year and used it quite often during a few trips to very remote areas. It is easy to use, clear, has a great battery life and came in very handy. A must in very remote spots. I got very good advice from the Ashbury team before my purchase and they definately helped me buy the right equipment for my application with the IsatHub and the Satphone 2. As an owner of the Inmarsat iSatPhone 2 I purchased over a year ago I have to commend the team at Ashbury for their professional service, advice and support. The ease of use, reception and battery life is exceptional on this fine device. As a longtime iSatPro user, my purchase of the iSatPro 2 phone was a logical step and i have to commend the team at Ashbury for their prompt service, advice and support. Even after purchasing my new phone, Asbury offered to upgrade and service my old phone, which i now use as a secondary/backup device. The iSatPro is a functional phone that gets the job done and keeps me in touch. As a private pilot, i have hooked up my phone to the comms and enjoy connectivity on the ground as well as in the air. Travelling or just being off the beaten track is just not an option without an Ashbury supplied ISat phone. The satellite service provider is Inmarsat and I understand that Inmarsat tracked the missing Malaysian flight which ended tragically in the Indian Ocean off Australia. Knowing this and having experienced the ease of topping up my “pay as you go” on my Sat Phone by email to Ashbury, I’m at ease when traveling in remote places like the Namib or Northern Namibia. An ISat phone is absolutely essential for anybody in remote places, its a life saver when needed! Before you spend enormous amounts on those ridiculous bullbars and other non-sensical additions for your 4×4, make sure you have that first R10k safely invested in a sat-phone. When you have lost that 2nd spare tyre, or your last fanbelt, you will really appreciate the true value of this serious device. And on the lucky trips, where you never take it out of its pouch, then the wasted R500 airtime was still a huge bargain! The folks at Ashbury are truly reliable and trustworthy people. Get one, now, and never be sorry. I received great service from Ashbury SatCom in purchasing my Satphone. The after service has also been great and I can definitely recommend them. I would like to start by thanking Ashbury for their exceptional and professional service and advice. A special mention on the after sales services of Ashbury and a big thank you to both Charles and Keith, both of whom went out of their way to provide me with extraordinary assistance on Christmas Eve (December 2014). The IsatPhone2 is a great phone, having had the opportunity to use a number of SatPhones during the past few years, the IsatPhone2 is in a class of its own, with specific reference to the overall ruggedness (IP65-Rating), long battery life, quality of the voice calls and the Bluetooth support, which makes this phone an indispensable travel companion. What I appreciate most about the IsatPhone2 is the quick “boot and connect” functionality, compared to previous generation SatPhones, from “switch-on” to “first call” in what seems like a few seconds. I mainly operate the phone in sub-Saharan Africa and the choice of network and phone is a perfect match to suite my usage requirements, again a big thank you to Charles and his team at Ashbury for their professional analysis of my requirements and the recommendation of the perfect phone and network combination to suit my specific requirements. If you are looking to acquire a SatPhone look no further than Ashbury for excellent advice and exceptional after sales support. I am certainly very pleased with iSatPhone 2. It takes just about as much time to boot up as my Samsung mobile phone, which is much better than I anticipated. Any nagging doubts I had about committing up here in the UK at 52 degrees North to a system that relies on a satellite hovering above the equator evaporated when I saw a 5 bar signal strength indication. Recently obtained my Day Skipper certificate and I’m looking fwd to sailing with friends. So did some research over the past few months and focused on Inmarsat GEO (as i am not planning to visit Greenland or Antarctic anytime soon). I only tested in London and made a couple of UK and international calls, pretty impressive voice quality, tho it takes some seconds to locate EMEA I-4 (25 degree east). But that’s just GEO for you which is different than how it works with LEO (e.g. Iridium). The longest call is well over 8 mins to far east and the recipient didn’t even realise I called from satellite (35k km away), so i’ve got nothing to complain so far. Will try to review more when I use the phone more extensively.